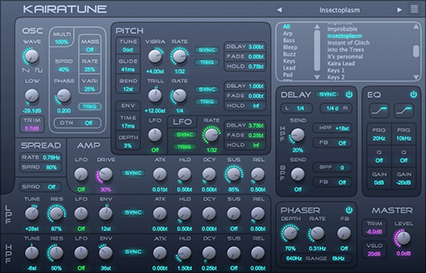 Kairatune is designed to produce crisp and tight electric sounds for electronic music production. Kairatune is engineered for the demanding producer who needs to push the sound to extremes without compromising audio quality. Kairatune offers fast and intuitive sound design workflow. The user interface is designed for a musician rather than an engineer and is based on the concept of pitch and beat in contrast to frequency and time. Kairatune lets you travel in the world of beats, notes and intervals instead of the logarithmic mathematics of frequencies and the rarely useful absolute time. Kairatune is not your all-in-one synthesizer. It’s designed and engineered to be as powerful and versatile as possible in it’s target role as your source for tight bass, unique lead and shiny SFX sounds. At the same time it makes all the effort to be simple enough to use, enabling you to add your personal touch and flavor to the sound and seek for the perfect fit to your mixing preferences.